BelleAire Press is proud to announce the 2018 revised, updated, and expanded ePUB edition of Flavors of the Fjords is now available for your reading enjoyment. 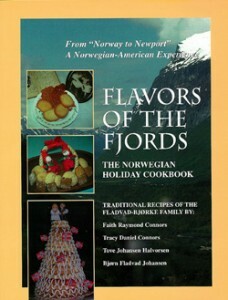 The first Norwegian holiday cookbook, Flavors of the Fjords includes many cookie and cake recipes never seen in “American” or “Scandinavian” cookbooks. 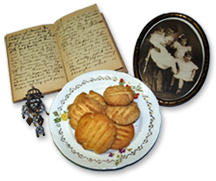 Authentic, mouth-watering, easy-to-prepare Norwegian holiday recipes updated (and tested) from an original, 19th century manuscript cookbook written by a beautiful immigrant to Newport , Marie Fladvad Cottrell. Based on the late 19th century hand-written manuscript cookbook prepared by Marie Theresa Fladvad Cottrell, a beautiful Norwegian immigrant who married into an established Newport, Rhode Island family at the turn of century. Lavishly illustrated, it offers over 300 photographs showcased by its 8 1/2 x 11 inch format illustrating life from Norway-to-Newport, R.I.–then and now–from period portraits and views of the late 19th and early 20th century, including antique post cards, to the present day. Unpublished photographs selected from private collections (including an autographed picture of Roald Amundsen, who discovered the South Pole), antique post cards, and contemporary Norwegian scenes. See King Harald and Queen Sonja receive the cheers of thousands of children during the barnetog or children’s parade portion of Syttendemaitog. One chapter traces the history of the Fladvad and Bjørke family farms (right) in Central and Western Norway from 1400-1900, using information obtained from Norwegian archives. Fascinating glimpses of life and times in Norway since written records were first kept are revealed. It includes an unusual section of letters and photographs from family members describing the trials of life in German-occupied Norway during World War II. Now available in both ePublication and hardbound editions. Price (Reduced): $18.49 | Shipping: $3.99 Sorry, shipping outside the USA is not available.